This weekend we went to Lava Beds National Monument in California. It took us about 5 hours to drive past Klamath Lake into California. cool campsite at A-11 in the Indian Wells campground where we set up a fire and chilled out with some beers before bed. first walking through cavernous openings only to find ourselves crawling on all fours trying to find glimpses of light leading to tight exits. Emily seemed to want to explore every hole in the ground which would have taken weeks! Most of the caves in the main cave loop were closed due to bats hibernating still but we were still able to see many of the main ones. After the cave loop we decided to head out towards Symbol Bridge and Big Painted Cave to check out the pictographs left by ancient indians in the region. Symbol Bridge didn’t have much but Big Painted Cave had many and was well worth the mile long hike to get to it. After Symbol bridge we ate some lunch by the truck then drove down the short road to Skull Cave which had the largest cave opening we saw in the entire park. 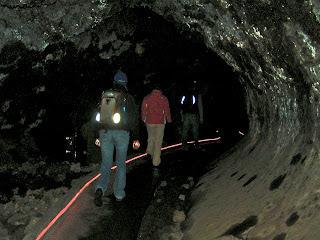 The cave was massive and lead down to an area that used to hold a great deal of ice that was mined from the cave. Unfortunately, the area was barred off and it looked like most of the ice had melted away. The ceiling of the cave on the way out was truly beautiful with many different greens and browns showing just how quickly it had cooled after the lava stopped flowing through it. I thought it was one of the coolest caves of the park but those with me disagreed. pristine and original. The wind was kicking up pretty fierce by this point and we all decided to head back into the main park again. was covered in yellow lichen but with water droplets on everything in the flash of my camera and in the beam of our headlamps it looked as if the ceiling was covered in gold and silver! We returned to our campsite to chill out and have dinner and drink some beers. It was a terrific day but in just one day we all felt as if we had seen most of what the area had to offer and agreed that it was one of those “just once” trips. Don’t get me wrong, we had a great time and saw a ton of cool stuff but there just didn’t seem anything else to explore. Emily and I retired to bed around 11 so we could get a good nights rest before her first big volcano ascent the following day.